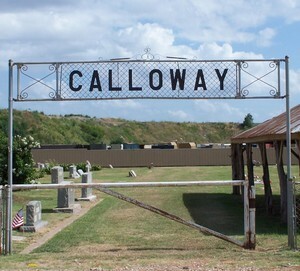 The earliest marked graves in this cemetery are those of two brothers, Richard H. Calloway (1832-1874) and Joseph W. Calloway (1829-1877), who owned this land in the 1860s. Richard’s widow Catherine (Coble) deeded 1.5 acres here in 1886 for use as a public burial ground. The original site included the family cemetery and graves of several neighbors. The wooden tabernacle was constructed in 1908. Families maintained the grounds until 1971 when a perpetual care fund was set up. Many pioneer settlers of eastern Tarrant County are buried here.